Music Player (Remix) is an advanced music app with many unique features. (Enhancement) Enable the ‘basic lock screen controls’ preference by default since this will also enable controls on Android Wear devices (it can be disabled in Preferences if desired). And you can now enable this option along with mini-player lockscreen controls. (Enhancement) On the ‘Mini-player’ Preferences screen, add the ability to adjust the position, width, and height of the mini-player detection area at the bottom of the screen. Chromecast support including notification, lockscreen, and advanced mini-player controls. In-app wiki browser for songs. If your favorite wallpaper app has a share option, you can set Remix’s wallpaper directly from the wallpaper app. Improve the visual appeal of the sliding panels. Add items from your Faves list to your playlists in multi-add mode. Music Player (Remix) is an advanced music app for Android designed from the ground up to be powerful, yet user-friendly and fun to use. Large, finger-friendly controls on phones and tablets. Tap the album art to pause/play & skip tracks. While using other apps, swipe from the bottom of the screen to reveal the “mini-player” allowing you to control your music and view/edit your Now Playing list without leaving other apps. Any time you add songs to your device, the app will issue a notification which when tapped will load those songs into a playlist and play them. From anywhere within the app, swipe from the bottom to reveal music controls and the Now Playing list. From anywhere within the app, swipe from the right side to access your music library, search function, help, preferences, and aesthetic options including wallpaper & menu color customization. From anywhere within the app, swipe from the left side of the screen to access your faves (one-touch access to songs/albums/artists), playlists, and autolists (auto-generated playlists based upon your listening habits). 5 customizable quick shortcuts are available on the Now Playing screen. Assign various functions to each one included Add to Playlist, Save bookmark, Lyrics, Share song, View YouTube video, and much more. All screens are optimized for portrait and landscape orientations. The Now Playing screen has been optimized for 7″ and 8.9″/10″ tablets. All library browsing screens have several display and sorting options. Save bookmarks in a song and visual markers will appear on the scrubber bar. Tap previous/next to jump between bookmarks or use the “View Bookmarks” option to select a bookmark. Any time you play a song, a bookmark is automatically saved when you leave the song. To go back to the previous play position in a song, use the “View Bookmarks” option. Download album art for any song or album. Select from several choices with different image resolutions. 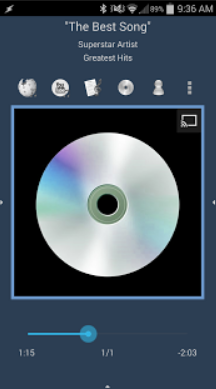 Album art is embedded directly in the music files. Download lyrics for a song which are embedded directly in the music file (or optionally saved in an external text file). Pinch/zoom the lyrics to change the font size. Feel like singing along? Use the karaoke feature to record yourself as you view the lyrics. Advanced playlist management including drag/drop song re-ordering & multi-add mode. While in multi-add mode, go to any screen within the app and tap songs/albums/artists/genres/composers to quickly add them to the playlist. When viewing an artist, swipe between the song list, the album list, and the artist’s wiki page. Wiki options are also available on the album, genre, and composer info screens. Stylish 4×1 and 4×2 home screen widgets. 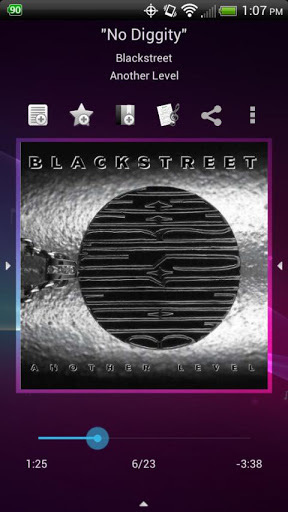 Various lock screen control options including basic controls (ICS+), advanced mini-player controls (ICS+), or the 4×2 widget (Android 4.2+).